No need to tilt your head back. Eyejusters offer clear adjustable focus over the full field of view, unlike traditional varifocals, multifocals or progressives. Some over-the-counter multifocal/progressive reading glasses are now available for close-up vision needs, but none of them provide clear vision across the field of view like Eyejusters. 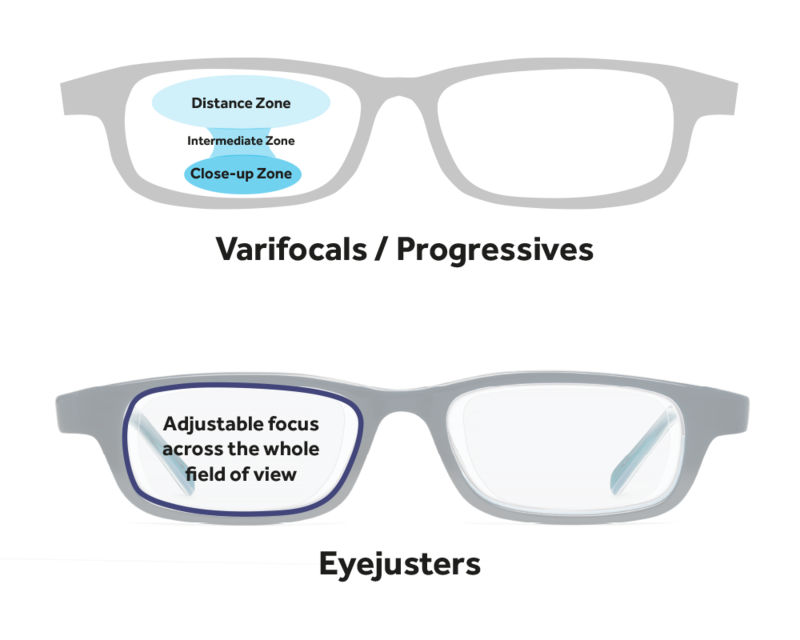 Although both varifocals/progressives and Eyejusters offer good vision at different distances, only Eyejusters offer it over the full field of vision. The perfect focus, where you want it. Varifocals/progressives have inherent visual distortions as the zones blend together which can make some people feel unwell. Eyejusters don't, and have low distortion all across the field of view. Most varifocals have a very narrow zone for intermediate vision. If your work or activities come in this range, Eyejusters offer better vision. Learn more about how Eyejusters can help you use one pair of glasses for everything.